A secret war brews in the night - a war where humanity is only a pawn. 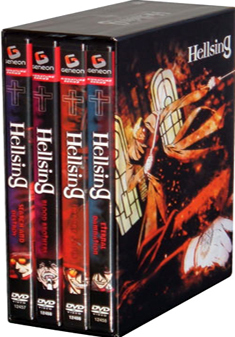 The Hellsing Organization deploys in the shadows to protect the mortal world. But now, artificially spawned vampires have appeared, forcing Hellsing to call in their ultimate weapon; the rogue vampire - Arucard! After he transforms the dying Seras Victoria into a vampire, they join forces to combat the undead army, as well as to quell their new found hunger.... Contains all 13 episodes from all four volumes of the series.